Dr Li is Senior Partner of Li, Tang, Chen & Co. He has been a member of the PolyU Council and PolyU Court. 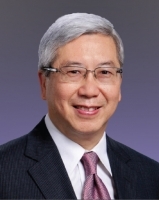 Amongst his public positions are Steward of The Hong Kong Jockey Club, and President of the Hong Kong Foundation for the University of Manchester and Member of its Global Leadership Board. Dr Li was Legislative Councillor from 1991 to 2004 and President of the Hong Kong Institute of Certified Public Accountants in 1994.